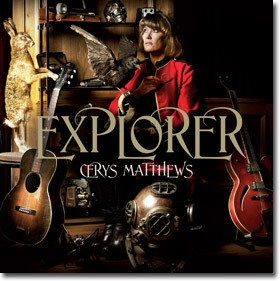 Explorer is the latest album from Welsh Singer-songwriter Cerys Matthews. Cery's first rose to fame as the singer of rock group Catatonia, but since the bands split in 2001 she has released several albums of folk and traditional music. She is unusual in that she sings in a mixture of English and Welsh. The album features some unusual musical instruments - the Duduk (an Armenian woodwind instrument), A Sitar, An Oud (a middle eastern instrument similar to the Lute), Chinese temple blocks, Vibraslap (a percussion instrument), a Shekere, a Kalimba and many other more instruments of varying degrees of familiarity as well. Explorer is a mix of songs written by Cerys and traditional songs. Cerys has described the album as looking at traditional songs around the world and looking at the similarities rather than the differences. By mixing instruments and songs together she succeeds in showing the similarities - if there were no similarities then its hard to imagine that singing a traditional irish lullaby with music from Armenian instruments could work well, but the fact is that it works superbly. This pattern of using instruments that arent from the same region as the songs continues through the album and works extremely well. "Ca the yowes" is a song originally written by Scottish poet Robert Burns, but arranged by Cerys, and is a beautiful love song arranged and played very simply so the focus is always on Cerys's voice and the lyrics. In contrast, "La Tarara" is a much more up-tempo Spanish song with the music more prominently featured. "Wade in the water" is the only track on the album where Cerys shares the vocal duties. She is joined by Searafina Steer, who has a much higher voice than Cerys, and the combination of these two very different voices singing the song with just a harp providing the music is very effective. This is a superb album that will appeal to lovers of folk and traditional music. I would also recommend it to fans of The Mediaeval Baebes as some of the songs have a similar feel, and in fact Frank Moon who plays on the album, also plays with the Mediaeval Baebes. Absolutely amazing album..they don't come better than this!